Florida is a “no-fault” state, which means it requires no-fault car insurance – also referred to as “personal injury protection” insurance, or simply PIP – in order to maintain registration and license plates for a vehicle. In other words, you cannot register your vehicle or obtain license plates for that vehicle in Florida if you cannot prove you carry the minimum amount of personal injury protection insurance. How Does PIP Insurance Work in Florida? Not all states are no-fault states, so if you have just moved to Florida or are otherwise unfamiliar with the state’s auto insurance laws, below are a few facts to help get you started. 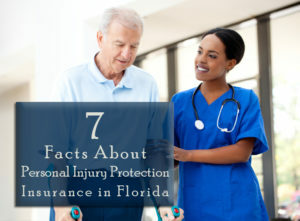 NOTE: Personal injury protection (PIP) insurance is just one type of auto insurance Florida requires. The information below can help you get a better working knowledge of what is involved with Florida’s PIP insurance, but it is always best to talk with your car insurance provider about all the different types of car insurance you need, including the amount of each. 1. What Does “No-Fault” Mean? Simply put, a no-fault state is one that requires no-fault insurance – also known as personal injury protection (PIP) insurance – which allows you to gain personal injury compensation from your own car insurance company. Because personal injury protection insurance works for you even if you are at fault for the motor vehicle accident, it is considered “no-fault insurance,” i.e. regardless of who was at fault for the automobile accident. Currently, only a handful of states are no-fault states, and Florida is one of them. 2. What Is “Personal Injury Protection” Insurance? Personal injury protection (PIP) insurance or no-fault insurance is a kind of insurance that helps pay for your personal medical bills after an auto accident, no matter who was at fault for the car crash. Typically, PIP insurance protects drivers from delayed payments during personal injury claims, as well as helps lower the number of lawsuits related to auto accidents. Going further, PIP insurance restricts the policyholder’s right to sue for compensation (again, lowering the number of lawsuits related to auto accidents). Understand that while it restricts, it does not necessarily prohibit. The automobile accident involved a serious injury or a death. The damages reached or exceeded a set amount. The conditions on which you can sue for further compensation are known as “thresholds” and generally are expressed in verbal thresholds (i.e. in verbal terms or description) or in monetary thresholds (i.e. in dollar amounts of medical bills). Keep in mind, a skilled attorney who specializes in personal injury cases related to auto accidents can help you navigate through personal injury protection laws. 3. How Much PIP Insurance Do I Need? Always talk with your car insurance agent about how much personal injury protection you are required to purchase, as well as any higher amount that would benefit you based on your own personal needs. 4. Does PIP Cover Me Even If I Caused the Accident? Yes. As a no-fault state, Florida requires no-fault car insurance. This insurance protects you up to the limits of your policy even if you are at fault for the accident. See “What Is ‘Personal Injury Protection‘ Insurance” above for more details on PIP insurance limits. 5. Who Does PIP Insurance Cover? Other members of your household involved in the automobile accident. * Generally, any passenger who owns a registered vehicle already has PIP insurance and is therefore covered under his or her own insurance policy. 6. What If My Passengers Already Have PIP? Typically, personal injury protection insurance follows the policyholder; meaning, if you are involved in a car crash and your passenger already has PIP insurance, then he or she will be covered by his or her own policy. Likewise, your personal injury protection insurance will cover you if you are involved in a car crash in someone else’s vehicle. 7. Does PIP Cover Me If I’m Not in a Motor Vehicle? Check with your specific auto insurance policy, but generally, PIP insurance covers you if even if you are not in a motor vehicle during an accident. For example, if a motor vehicle strikes you while riding your bicycle or walking down the street, your personal injury protection insurance would cover you up to the limits of your policy. Also, PIP covers you if you are involved in a motor vehicle accident and you are in someone else’s vehicle. Again, always talk with your auto insurance provider about the specific details of your PIP insurance policy. Have You Been Involved in a Florida Car Accident? Regardless of how well you think you understand Florida insurance laws, things can get tricky if you are actually involved in an accident. For example, if the other party was at fault but your damages go beyond your personal injury protection insurance, can you still get further compensation? What if a vehicle strikes you and your bicycle and the damages exceed your personal injury protection, but the vehicle owner doesn’t carry personal injury protection? Questions like these and many others are why it is so important to have an attorney who is skilled in personal injury related to auto accidents on your side. Serving the Boca Raton, West Palm Beach, and Fort Lauderdale areas in Florida, the personal injury attorneys at Leifer Law Firm are ready to help you get the compensation you deserve. Give us a call at (561) 395-8055 or contact us online today to schedule your free consultation. We will help you better understand no-fault laws, including personal injury protection insurance, as well as talk with you about obtaining compensation past the personal injury protection limits. Leifer Law Firm provides personal injury representation to clients in South Florida including Palm Beach County, Broward County and Miami-Dade County, which includes, but is not limited to, the communities of Miami, Boca Raton, Fort Lauderdale, West Palm Beach, Deerfield Beach , Delray Beach, Boynton Beach, Lighthouse Point, Plantation, Lake Worth, Hollywood, Parkland, Coral Springs and Weston.